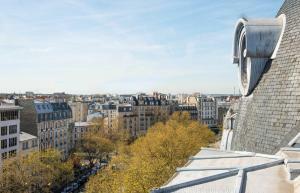 This hotel is just a 15-minute walk from the Champs-Elysées and the Arc de Triomphe. It offers massage treatments and modern accommodation with a 1930's décor and free Wi-Fi access. Each guest room has a private bathroom. They are soundproofed and equipped with air conditioning and a flat-screen TV. A breakfast buffet with homemade pastries is served daily in the lobby area. Guests can also relax by the fireplace in the bar, which features live music once a month. 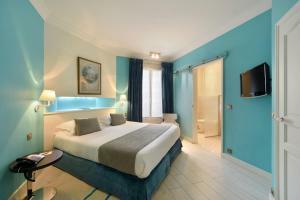 Hotel Banville is a 2-minute walk from the restaurants at Place du Maréchal-Juin. Porte de Champaret Metro Station is 100 metres away. Private airport transfers can be organised at the 24-hour reception. 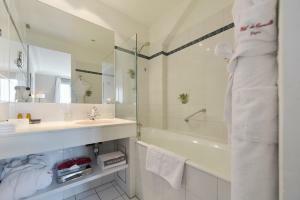 Free Wi-Fi access and a flat-screen TV are provided in this air-conditioned room with en suite. An extra bed is not possible in this room. Rate: € 134.33 ... € 579.00; select dates below to get current rates. Free Wi-Fi access and a flat-screen TV are provided in this air-conditioned room with en suite. These rooms feature unique décor that blends traditional and antique pieces with contemporary design. An extra bed is not possible in this room. 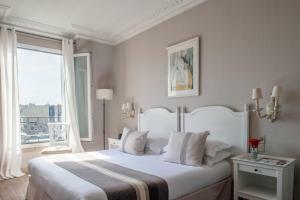 This bright and airy suite is on the top floor of the hotel and has a private balcony offering views of the Eiffel Tower and Arc de Triomphe. It includes a living area with a sofa, free Wi-Fi access and 2 flat-screen TVs. 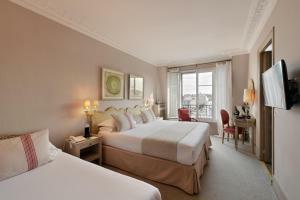 This elegant double room features a minibar and a flat-screen TV with satellite channels. The bathroom includes a hairdryer, bathrobe and free toiletries. An extra bed can be accommodated on request. This double room has a minibar, satellite TV and electric kettle. Rate: € 271.56 ... € 463.00; select dates below to get current rates.